When the original Wismec Reuleaux DNA200 and RX200 first released some time ago, it immediately became a hit in the vape world. It was one of the first mass produced triple battery vape mods that was actually very comfortable to hold and simply performed well. 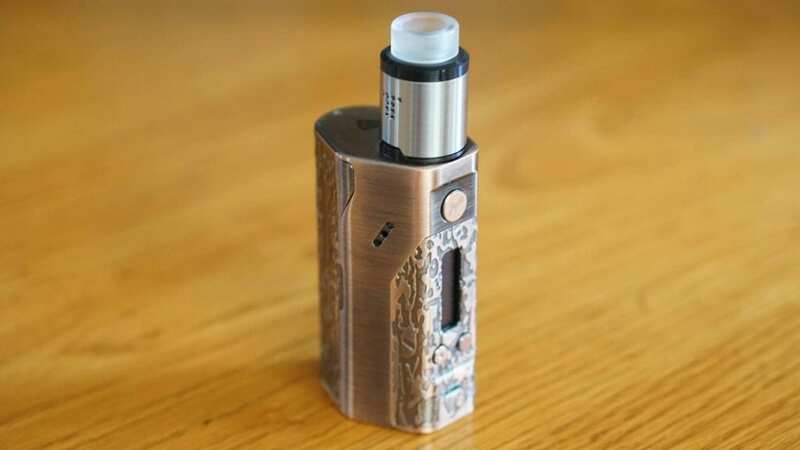 Now, they’re back with a limited version and this time around it sports the latest DNA250 board from Evolv alongside a new and unique bronze finish. Before getting any further, we’d like to thank VapeSourcing for sending this device our way for the purposes of this review. We’ll cover our first impressions, usage, performance, pros and cons, and conclude with whether or not we recommend the Wismec Reuleaux DNA250 Limited Edition! Click Here to Check Out the Wismec Reuleaux DNA250 Limited Version! The Reuleaux DNA250 Limited Edition by Wismec comes in a fairly standard packaging and we’ve seen it with most Wismec devices. Honestly, since this is a “limited version”, I would’ve have liked to see some different packaging to indicated this. It’s not a huge deal by any means, but it would’ve been nice to see something different with this one specifically. Regardless, it does come packaged well, and I can say that this device will be kept safe during transit. 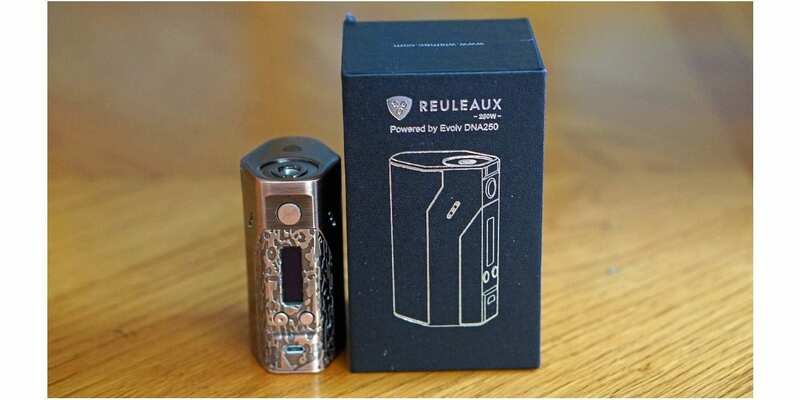 On the front of the box, you’ll see an image of the Reuleaux alongside it stating that it’s powered by the Evolv DNA250 board. On the back of the box, you’ll see some other minor information such as what’s included. Once you slide it open, you’re immediately met with the Wismec Reuleaux DNA250 Limited Edition. At first glance, I thought it was made of copper or brass due to its color, but it’s not. 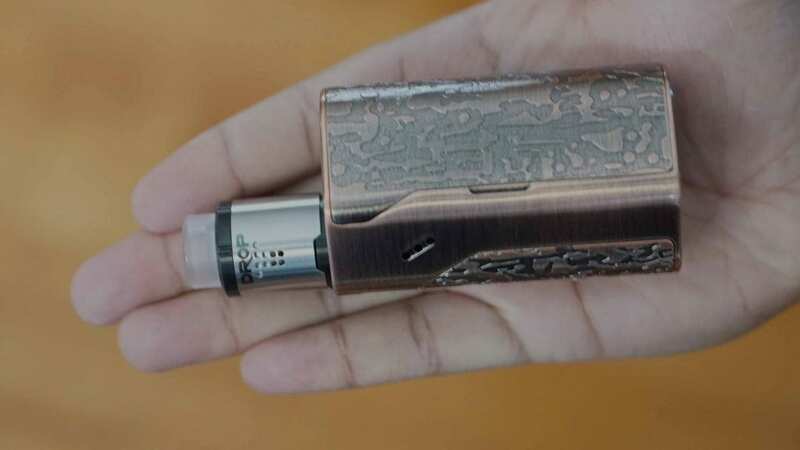 It has a bronzed look to it, which surely is eye appealing and much different from what we’ve seen recently with vape mods. Personally, I don’t like the smell of copper or brass on my hands, so I was actually glad it wasn’t constructed of either. This is subjective of course. On the front panel where the screen is, and on the battery door there is a unique design. I’m not sure exactly what to call it, but it gives it some “spice”. The overall design is pretty much the same when compared to the original DNA200 version and RX200. This is a good thing in my opinion as I was a huge fan of the originals. To me, this is still one of the most comfortable triple 18650 box mods and we’ve seen many other vape brands kind of use the same form factor. The battery door is held into place with magnets and there was no play whatsoever. The firing button does have the JayBo logo, which is certainly a nice touch to add. The micro USB port is on the front right underneath the wattage up and down buttons. In addition, there is ventilation located along the side of the mod. Overall, my first impressions of the Wismec Reuleaux DNA250 was great! I had no cons to mention and I liked the overall color. Not to mention, I was very happy to see that they stuck with the original form factor. Like mentioned previously, the Wismec Reuleaux DNA250 does require three high drain 18650 batteries for operation. Getting the batteries in and out of this device is incredibly easy as it does have spring loaded contacts. It’s actually easier in this one when compared to previous models from what I remember. I had no issues with this one tearing my battery wraps. One thing I do want to mention though is that my batteries with thicker battery wraps made the battery door not close all the way. In addition, I would have issues trying to get the battery door completely seal with these specific batteries. It would always be on one side of the battery door that wasn’t closing all the way. I’m not exactly sure why this would happen, and I even tried squeezing the battery door to make a tighter fit, but that didn’t work either. This was a major con for me, as I could feel the battery door move ever so slightly when I was holding the mod in my hand. It’s not a huge gap, and it could only be my unit specifically, but I still have to mention it regardless. Do keep in mind this happened with batteries that had thicker battery wraps such as rewrapped batteries. I did get over this issue eventually, but I still wish this issue wasn’t present. The Wismec Reuleaux DNA250 does feature an ergonomic design, making it comfortable to hold. When three batteries are installed, it does become quite heavy as expected. I didn’t mind carrying this around in my pocket or bag, especially if I knew I needed extended battery life. If you’re wanting something lightweight then this device may not be something you want to carry around in your pocket, but it wouldn’t be an issue if it were in your bag or purse. Navigating the menu of this device is pretty straightforward, especially if you’re previously used a DNA box mod. Once you have batteries installed, a single click of the fire button will turn it on. Once it’s on, five clicks will unlock or lock it. When it’s unlocked, you can hold the wattage up and down buttons to swap wire profiles, and in this case they have watts, a few Ni200 options, SS316, SS430 and Ti. While the device is locked, you can hold the fire button and wattage up button to lock the resistance of the attached atomizer. In addition, while locked you can hold the fire button and wattage down button to swap between normal mode and stealth mode. Lastly, when locked, you can hold the wattage up and down buttons to adjust the temperature setting. It can be a bit complicated for the beginner, but once you get used to it, it’s fairly easy. Not to mention, you can connect this device to your PC and utilize the EScribe software to completely customize it! Something worth mentioning with this device is that atomizers up to 25mm will have no overhang. However, some atomizers I did attach had a small gap, especially atomizers with longer 510 pins. I didn’t have an issue with this specific atomizers making a connection, but I know some vapers hate that gap. It wasn’t large gaps by any means, but it was still present and worth mentioning. All in all, using this device over the past few weeks has been good! I did have 2 cons to be mentioned though, and the biggest one for me was the battery door issue I was experiencing with batteries that had thicker battery wraps. I personally didn’t mind a small gap with some atomizers. 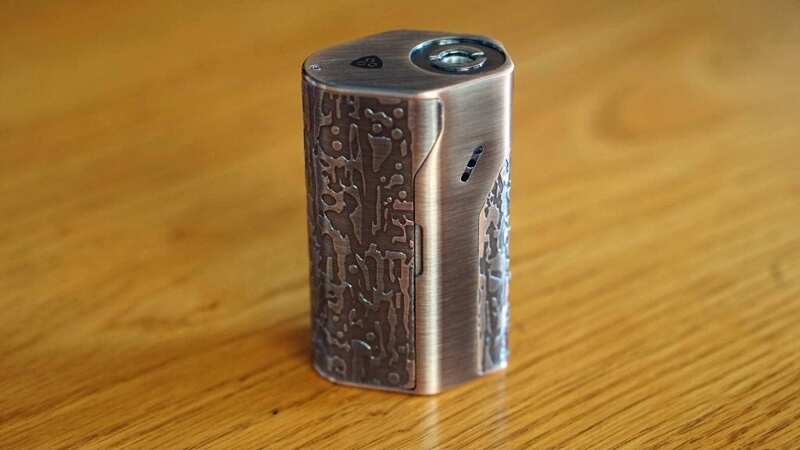 This box mod is powered by the Evolv DNA250 board and since utilizing 3 high drain 18650 batteries, it provides an accurate wattage output of 250w. This amount of wattage is pretty much good for the vast majority of vapers. I personally vape between 50w and 100w most of the time. I’m a big fan of the DNA board by Evolv, whether it’s the DNA250, DNA75, DNA60 or DNA75C. The performance of these boards are incredible, and one of the best on the market in my opinion. With that being said, the temperature control performance is top notch. I did only test the TC mode in stainless steel since that’s the only TC capable wire material I personally vape, but I’m sure the performance in Ni200, Ti or any other TC capable wire will be excellent. The wattage performance of the Reuleaux DNA250 Limited Edition is smooth and consistent. One of the best aspects of the Evolv chipsets is that you can download the EScribe software and connect this device to your PC to completely customize your vape experience. While this may be a bit overwhelming for the beginner, the advanced user will simply love this. If you’re not familiar with it, I do recommend checking out a few videos on YouTube. The battery life on this box mod is excellent, and this is expected as well since it is powered by 3 batteries. Vaping between 50w and 75w, I could easily get almost 2 full days of vaping. If I were vaping between 75w to 100w, I could certainly get a full day of use before needing to replace or charge the batteries. Of course, if you’re vaping at much higher wattages, then your battery life will not be as lengthy, but still pretty good when compared to dual 18650 vape mods. Overall, the performance of the Reuleaux DNA250 is excellent and this is to be expected since it does house the Evolv DNA250 board. The battery life was great and the TC performance was second to none. In conclusion, the Wismec Reuleaux DNA250 Limited Version is a great addition to the family of Reuleuax box mods. I do like it’s unique bronzed color, and I am quite happy that they stuck with the original design. The fact that this one was updated with the DNA250 board is definitely a huge pro for me, as the performance of this board is one of the best on the market today. Although I loved the performance of this mod, there were some cons to be mentioned. The two major cons for this one was the battery door issues with batteries that had thicker battery wrap and the fact that some atomizers had a gap. Now, I eventually got over the battery door fitment issue since it’s not a huge gap and the atomizers I was mostly using with this device had no gap. Personally, gaps don’t bug me too much with atomizers, but I know some vapers absolutely cannot deal with it. Thankfully, I haven’t had any issues with atomizers making a connection, but if I do I’ll be sure to post an update. All in all, I’m a fan of this device and I knew I would be since I liked the original DNA200 version and RX200. This is a limited edition, so I’m not sure exactly how many were produced. If you’re a fan of the originals like I am, or simply looking for a unique DNA250 box mod that houses 3 batteries, then the Wismec Reuleaux DNA250 Limited Edition is something worth checking out.